Born in New York City, Justice Barbara J. Pariente has been a Floridian since 1973, when she moved to Fort Lauderdale for a two-year judicial clerkship with Judge Norman C. Roettger, Jr., of the United States District Court for the Southern District of Florida. In 1993, after 18 years in private practice specializing in civil trial litigation in West Palm Beach, she was appointed to the Fourth District Court of Appeal, where she served until her appointment to the Supreme Court of Florida in 1997. 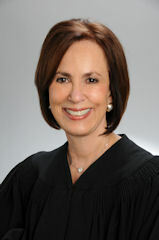 She was the court’s chief justice from 2004 – 2006, the second woman to serve in that role. Justice Pariente distinctly remembers her first visit to the Florida Supreme Court. It was November 1985. In private practice at the time, she had traveled from West Palm Beach to Tallahassee to witness an historic event: Fourth DCA Judge Rosemary Barkett, her longtime friend, being sworn in as the supreme court’s first woman justice. On a visit to Tallahassee more than a decade later, after having applied to fill a vacancy on the state’s highest court, she was struck by the realization that she, too, might someday be sitting on the supreme court bench. She was visiting the state capital with Doris Davis, a young woman whom, through the Take Stock in Children Program, she began mentoring in 1996 (that relationship continues today: Ms Davis is now an attorney, mother of two, and wife living in Tallahassee). Recollecting that day, she said, “I have a memory of standing at the Capitol. I looked across the street at the supreme court and said to Doris, ‘I may be working there one day!’ And that excitement I felt is something I’ll never forget,” she exclaimed. By the time Justice Pariente retires, she’ll have been on the supreme court bench for just over 21 years, making her Florida’s ninth-longest serving justice (since the court first sat, in 1846, it has had 86 justices). For those who know her at all, it should be no surprise that, when asked what she has most looked forward to while driving to work each day, this quintessential people-person instantly replied, “the people! Being able to interact with my staff attorneys and with Brenda Williams [her judicial assistant] to do the work of writing opinions and the administrative work—that’s something I’ve really enjoyed. When I come to work, there’s Brenda, and no matter what’s going on, she’s always upbeat. A cheerleader! She’s been a great source of joy in my life.” After a pause, she added, “There are so many people here at the court that I have great affection for. Like some of the deputy marshals who’ve worked here.” She also singled out the staff of the Office of Court Improvement, a unit in the Office of the State Courts Administrator, to whom she expressed gratitude for having done “some of the heaviest lifting” in helping the branch implement its visionary family court (a project she spearheaded) and problem-solving court initiatives. In addition to the people, Justice Pariente has “really enjoyed” the behind-the-scenes work of the court, especially “the crafting of opinions,” a process that has altered dramatically “because technology has improved so much over the last 20 years.” She remembers “having to rely on my staff to make handwritten changes in the past,” but now, “features like track changes and bold and strike through make the process so much easier.” She also looks forward to court conferences, which she described as being, “with a couple of exceptions over the years, generally very collegial. We do important work during this time, in a way that respects everybody’s opinion.” When speaking to new judges, Justice Pariente invariably stresses the values of collegiality and of “being willing to listen, learn, dialogue.” She conceded that while the justices “don’t always agree, we are always collegial.” As of late, justices are no longer expected to live in Tallahassee full-time, so building collegiality might become a greater challenge, and she worries that “That change is going to have an effect on the court.” But she suggested that this potential issue “could be remedied by the times when everybody is here, during oral argument and court conferences; the justices can make it more collegial by maybe having lunch or dinner together. Collegiality is an important part of being on a seven-member court,” she emphasized. On the heels of her musings about the pleasures of opinion-writing, court conferences, and oral arguments, a query about the accomplishments of which she is most proud led her to reflect on some of the most consequential cases on which the court has ruled during her two decades on the bench. Naturally, Bush v. Gore came to mind first: “I was proud of the court during that time, and I was proud of what the majority of the court decided in the final decision that the US Supreme Court disagreed with,” she declared. “I think we were right,” she added, “And we did it under very difficult circumstances. I’m very proud of that.” She also referred to “the court’s rulings on reapportionment, which went on for several years,” calling this work “something that will live on” (the Florida Supreme Court was called upon first to rule on whether the 2012 apportionment of Florida’s legislative districts violated the Florida Constitution and then on whether both the state house and congressional districts violated the Fair District Amendments to the constitution by advancing partisan political intent). She is also categorically proud of the concerted way in which everyone in the branch worked to facilitate the smooth implementation of Revision 7, a 1998 voter-approved constitutional amendment designed to relieve local governments of the increasing costs of subsidizing the trial courts and to ensure equity in court funding across each county, enabling every Floridian to have access to essential trial court services. Revision 7 took effect on July 1, 2004—the day before Justice Pariente began her two-year term as chief justice. Her pride in the success of this branch-wide transition process is captured in her “Message from the Chief Justice” heading up the 2004 – 2005 Florida State Courts Annual Report; here, she called attention to the momentousness of the achievement and to the stalwart efforts of the judges and court personnel who made it possible: “This has been an historic year for Florida’s judiciary. The excitement began the very first day of the fiscal year, when the branch finally became a truly unified court system funded with state money. Although realized on a single day, this major transformation was several years in the making. And it simply could not have been accomplished without the hard work of many people in all three branches of state government. Most Floridians never noticed a thing on July 1, 2004. That was a good thing—and it was thanks to the skill and dedication of the hundreds of people who spent many thousands of hours on the transition to the state-funded court system that voters demanded when they approved Revision 7 to the Florida Constitution in 1998,” she wrote. But of everything Justice Pariente has worked to accomplish since January 1998, when she officially began her work as a supreme court justice, she is “most proud of the movement in the court system over the last 20 years in the area of family and problem-solving courts.” The judicial branch’s Steering Committee on Families and Children in the Court—which just awarded her its inaugural Justice for Children and Families Award—attributes much of this “movement” to Justice Pariente’s vision, passion, and dedication over the years. Her formal involvement with family court began in January 1999, when she was named supreme court liaison to the Family Court Steering Committee. The steering committee’s crowning achievement was its development of recommendations, guiding principles, and essential elements for a model family court, which were unanimously approved by the court in a 2001 opinion. She worked closely with this committee and its subsequent iteration for 17 years, serving either as its chair or its justice liaison, guiding its multidisciplinary efforts to establish a fully integrated, comprehensive approach to handling cases involving children and families. While she recognizes that “There will always be much work to be done for Florida’s vulnerable children and families,” she also “beams with pride” when she considers the steering committee’s accomplishments over the years: the creation of resources to assist judges, court personnel, and litigants; helpful changes to the rules of judicial administration, family law rules of procedure, and Florida statutes; the coordination of statewide conferences and workshops as well as regional trainings, technical assistance site visits, and local training events; the development of streamlined procedures to help with the identification of related cases; and the implementation of the one family/one judge model in circuits across the state. Although Justice Pariente will miss being on the front line of these life- and paradigm-changing initiatives, at the same time, she is quick to assert that she will decidedly not miss certain elements of the job. “On a personal level,” she affirmed, “I will not miss being separated from my husband” (until he retired in 2013, Fred Hazouri was a DCA judge in West Palm Beach). “Being separated from him, from my mother [who passed away in December 2017], and my family has been a real hardship,” she confided. Because she has lived at a distance from her family, she’s had to go through “some very difficult things here by myself,” she said, mentioning the Bush v. Gore cases and her treatment and recovery from breast cancer (with which she had been diagnosed in March 2003). “And these years on the supreme court have not exactly been a walk in the park” on a professional level, either, she admitted, calling them “very stressful, sometimes contentious.” She understands that “You’re never going to please everyone. In fact, in any case, there’s going to be someone who’s winning and someone who’s losing, so you’re never going to please all the litigants.” And she also knows she has to “try to keep a thick skin when you’re attacked by people who are unhappy with the decisions we reach. But it can be difficult at times,” she revealed. Retirement also means returning to West Palm Beach and spending more time with her family. Another grandchild—her eleventh!—was born a few months ago, and she is eager “to enjoy another newborn. It’s the best thing, to be a grandparent, because you don’t have to get up at night, and you can just enjoy the innocence of this new life!” she enthused. As for leaving the court, she said, “I‘ve gotten so much out of this and hopefully have given a lot. I feel I will miss it. For more information about her historic career, read the biography written by state courts writer Beth Schwartz.